Hi Dare 2B Artzy friends! Hope everyone had fun with last weekends Dare 2B Artzy 3D Spring Blog Hop? There was so much inspiration from my very talented teammates!! Hope you found something fun to try out or were inspired to create your own Spring 3D Project. I know I need to stock up on paper because there were more than a few things that I’d like to make. I’m back today with another fun Dare 2B Artzy card to share! 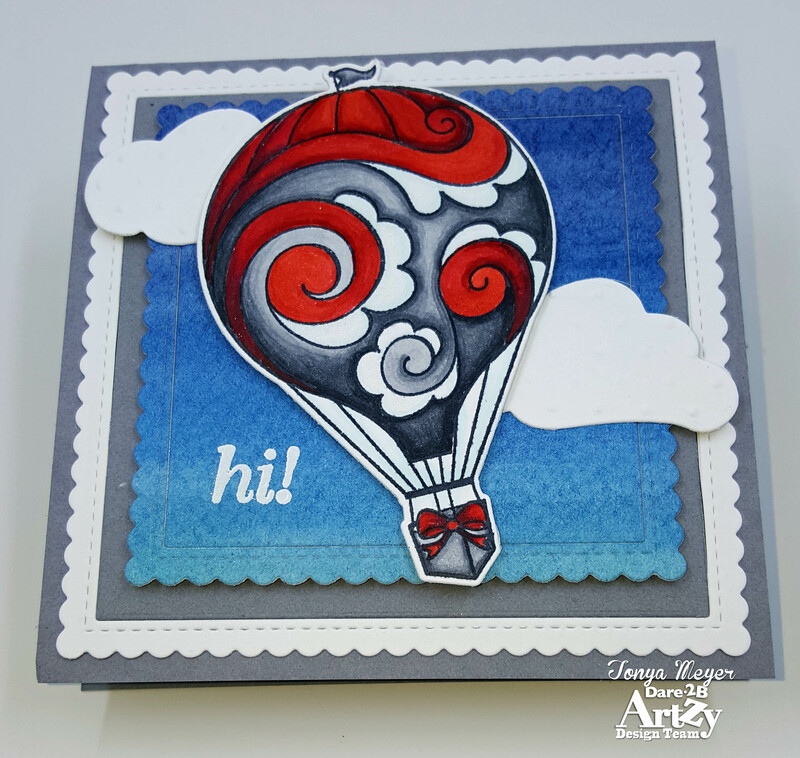 I’m using an older Dare 2B Artzy stamp set called Lift Your Spirits which features two gorgeous hot air balloons, some clouds and several sentiments which are perfect for several different occasions. Personally, I’ve always wanted to go up in a hot air balloon, but just haven’t had the opportunity. I’ve also wanted to go to the Balloon Festival in Albuquerque, NM . Both are on my Life TO DO list. In the meantime, I’ll just have to settle for making cards with balloons on them. 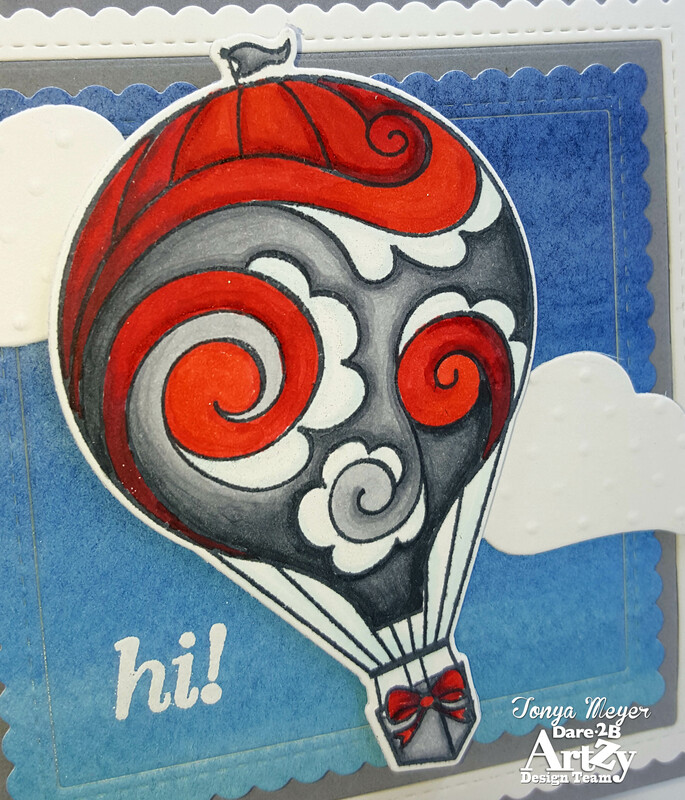 To create the card, I started off by stamping the large balloon in the Lift Your Spirits stamp set with the Dare 2B Artzy Totally Black ink. I knew I was only going to use a 2 color scheme on my balloon and I wanted it to be bold so I naturally I went with my Copic reds (R24, R27, R29, R59 and R89) and my neutral greys (N1, N3, N4, N7 and N9). I colored most everything leaving a bit of white on the scalloped sections of the balloon. I added just a hint of B0000 to the white sections. When the Copic coloring was dry I added a bit of clear Spectrum Noir Sparkle pen to the white areas of the balloon. As I was working on this project I kept thinking about the song, “Up, up and Away in my beautiful, my beautiful balloon…”. It was a song my grandma played on her record player when I would spend summers with her. Guess the song stuck with me, LOL! Once, I’d finished coloring everything, I ran the colored balloon through my die cutting machine using the matching Dare 2B Artzy balloon die. At the same time I cut a few of the clouds out of some white cardstock as well. I was going to create a brand new background for this card, but since I was cleaning my craft space in my home office that I share with my hubby this past weekend, I ran across a stack of pre-colored pieces that I’d done before the holidays. I don’t know about anyone else, but many times I’ll color and image or play around with my watercolors, airbrush, stencils or whatever and create something. Those pieces may not fit with current projects that I’m working on and truthfully sometimes I don’t even like them, but I rarely ever throw them away because there may be a project down the road that I can utilize them. Also, many times I change my opinion about something I’ve created after I haven’t seen it for a while. It can save a lot of time having a background or colored piece that’s already completed when making cards. I have a paper tray that I throw them into and then when I go through it periodically, I find a treasure trove of art to be used and sometimes new inspiration as well. That was the case with my blue background for this card. I’d created a 8×10 wash of water-color using my Gansai Tambi water colors a few months ago and I saw it and thought it would be perfect for my backdrop to my balloon. I cut the piece down into 4 sections (saved the other 3 for later projects) and die cut one using a scalloped square die. The die actually creates a stitched square and then a scalloped frame which are two separate pieces, but I used some craft tape on the back of it to keep the frame and square together. I used a larger scalloped square frame for the bottom layer and cut one from some grey cardstock and one from white and then swapped them to create the base layer with the white scalloped frame. For my Dare 2B Artzy die cut clouds I ran them through my die cut machine with an embossing folder called Swiss Dots from Cuttlebug to give them a bit of texture. I layered up the blue layer and my balloon with some dimensional foam to give them a bit of pop. I stamped the “hi!” sentiment with some Versamark ink and heat set it with white embossing powder to the blue watercolor panel. I love that lowercase sentiment – it’s so fun! All of my layers were matted to a piece of grey 110 lb cardstock that measured 4 1/4 x 4 1/4. I hope you enjoyed my card today. 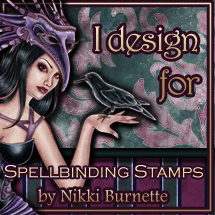 Be sure to check out Dare 2B Artzy’s online store for the Lift Your Spirits stamp set and matching die. 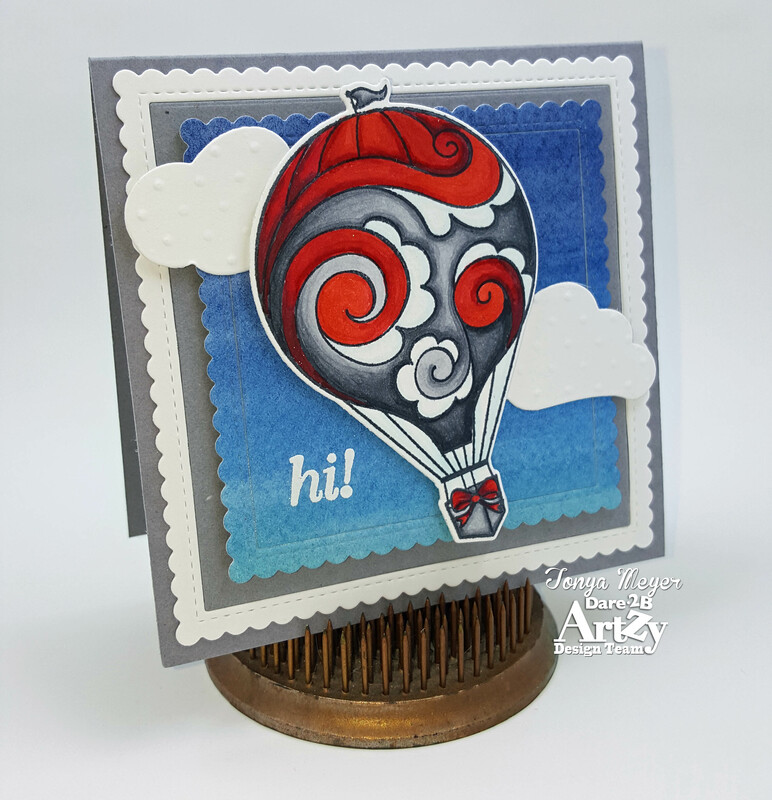 The die coordinates with all of the Dare 2B Artzy hot air balloon stamps so you can create your own Balloon Fiesta and send it to a friend.